Really well filmed and acted. Big name cast. One might argue it's a tad tabloid, histrionic, pulp fiction. In a word: corny. So there you are, the audience, perhaps with popcorn. Here are your freaks: more beautiful than average, in a world of cruelty. Quite the novel (soap opera, whatever). The setting is the time of hobos, men sans work, riding the railroads to redistribute their labor, much as Amazon caravaners, other Dead Head type tribes, do today. Wandering gypsies, in a Gypsy Economy. Welcome to 2018. The plot features a triangle: circus impresario (reminds me of Bug's Life) with stunning wife-horse act, hires protagonist of Polish background to work with the animals. In a desperate economic gamble, an elephant is acquired, and it turns out she speaks Polish, meaning the impresario with anger management problems manages to not wreck his own circus for at least awhile longer. Anyway, I was really impressed, especially by the elephant playing Rosie. Queued for Iranian TV? Total film nuts, like the Japanese. Anyway, I'm proposing it for Pyconic conferences, for the movie track (similar to the hallway track, quite informal, more like BOFs). The progressives say Russiagate is distracting from the student debt problem, plus so many Americans are political prisoners of the Feds, post the ending of Prohibition (part 2) on the part of several states. Facing these issues is too painful for those with no solutions, so the scapegoats are to blame. An old story. In the meantime, geeks such as helped win WWII for the British, the Turing Types, have transformed the face of education to where the logical API is your dorm room studio aka home. The lectures are all there, as are opportunities for two-way and multi-way communication. Concentrating on making the home a true PWS (personal workspace) makes more sense than borrowing money to invest in someone else's digs. How many homes might one person afford (a great many, in some cases)? The point: "free college" as some imagine it, might not be as brick and mortar nor as easily paid for on the backs of young people. Getting relief from those loans might involve entering another service, one that pays loans back, but perhaps in a devaluing currency. Inflation is on the side of borrowers right? Not all M1 denominated in dollars are actually Treasury bills. But I'm getting ahead of my story. Maybe we could pay them in Bitcoin or other cryptocurrency to redo college but in a different way, one that involves work/study which could mean world travel, and you might not have to wear a uniform or carry weapons. The world is getting really sick of weapons and those who find them necessary to their survival. Weapons used recreationally, not for crimes, are not actually weapons, nor sold as such. A nuance of the language. Anyway, I think patriots of all countries can rally around a university system that rescues more than it impedes. There's a transfer of wealth going on, in entropic terms, from the sun to the earth, meaning an increase in entropy there, leading to eventual gigantism or brown drawfism, is feeding syntropy here, or potentially is doing that. Or ability to order information has gotten rather good, what with big data and server farms and all. Russiagate looks like an attempt to stop hacktivism and assert Federal control in new overreaching ways. The move to criminalize self expression is quite one sided, with corporations free to pour money into Federal coffers, but forbidden to engage in private ventures unless friendly to same, willing to pay tribute and bribes. A kind of extortion is happening, whereas a lot of the geeks who worked hard on this railroad were not doing so for the aggrandizement of any District, of Columbia or otherwise. We'll see if the FBI is successful, in combination with the Patriot Act and other tools, in continuing to prosecute anyone using social media in ways disapproved of by the DOJ or any of several players set up to enforce a set of rules within a particular jurisdiction. Those using Facebook to advertise their post Prohibition product lines are engaging in activities the DOJ has criminalized, or so they might soon allege. But how does one tell Facebook to deny Californians access to home grown social media? Silicon Valley is not about to surrender its economy to east coasters who don't know bash or think Ubuntu is some kind of drink. Magic Squares in NumPy, who is doing them? I'm not saying they need to be auto-generated. Copy some well known ones into code and run the NumPy version of sum along each of the two Magic Square axes. A sudoku would be another data structure to model. You can get to each sector with what's called a "view" or slice into just those cells, no extra memory for the data, just the overhead of the frame. A sum in each sector keeps track of same. As a former calculus teacher, now into statistics, I'm thinking we don't do enough in standard high school calc, to bridge probability density functions (PDFs) with their integrals, their cumulative distribution functions (CDFs). So what if closed forms don't always jump out at us? We've got the numerical tools to power through without those if need be. I'm glad to have an API with the school system. I thought Measure 97 might bring that about, and approached the Methodists about a certain Code Castle. I also named a sculpture in my living room "code castle" and covered it with stuffed dragons. Instead, I got a part time teaching job after school and get to chat with parents and teachers, other guardians, several times a week. When it comes to teaching adults, Californians are more ravenous for a geek diet than Oregonians it seems. I'm happy to feed a hungry neighbor. 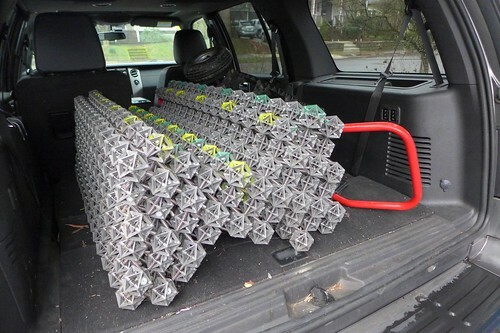 "Code castle" (the sculpture) is being recycled for parts and the Spooky Castle (former church and community center) showed up in my Jupyter Notebooks on what we call "context managers" in Python. They have their __enter__ and __exit__ methods, the latter perhaps charged up with Exceptions it needs to deal with. Jupyter Notebooks, for those of you who wish to learn, are interactive web pages you may run locally (i.e. on localhost 127.1.1.1) that talk to a kernel such as Python or Haskell or maybe R, the statistics engine. I need to remind my students: Jupyter came from Julia, Python, R as the initial target languages of an expanded I-Python Notebook project. I'm keeping an eye on my political radar, but when it comes to putting out blips of my own, I'm finding Facebook most congenial. Twitter too. These platforms are ideal for PR, and PR is what I do. Of course Twitter is infested with bots. There's an API to tweet from your programs. Who wants to hire some poor stooge to make stuff up when you can just have a rotating queue. Let C-level executives commit, just like Trump does, if you don't delegate to your CMO. The idea of Russians buying ads on Facebook doesn't bother me even a little. The British do it too, which bothers me a little more. I don't trust British suspicion of the Russians usually, as it relates back to their inheriting Roman Imperialism, a meme virus. Americans were infected with that too, and tend to crow about it as a chief asset. Just look at DC's architecture. Anyway, the idea that nations seek to influence election outcomes does not disturb me. It's a tiny planet and we all have a stake in the various outcomes. The sooner we acknowledge what goes on, and stop trying to deal with it by criminalizing it, the better. As thought-leader Kyle Kulinski (Secular Talk) points out, one man's "collusion" is another man's smart business plan. There's no law against making friends with friends of the enemy, unless one has such complete control of the law that one is able to legislate permanent "good guy" status. That's the tautological underpinnings of jurisprudence: protect the jurisdiction of the jurists. Give judges the right to judge. Romans could tell us all about it. My theory, which traces back to a little reported story, is that Protestants in particular are feeling an existential threat from three sides at least. Firstly, one of their chief Bible thumpers switched sides to Eastern Orthodox (the under-reported story). Secondly, the Second Coming of Christ (SCC) doesn't appear to be happening in our lifetimes (not a new problem). Thirdly, secularism isn't vanishing either. The strategy has been to pursue the main corporate PR initiative of the last century: link Christianity to both Capitalism (the dream of instant riches) and Patriotism (the willingness to die for capitalists) by injecting In God We Trust language and giving it a patronizing spin. The heinous crime of the ages has always been heresy, and without calling it that, there's still a strong urge to demonize. Speaking of powerful symbols, why was KKK cross-burning never seen as a desecration of the Cross? Burn a flag and you're disrespectful. Burn a cross and you're a good old boy. Makes no sense. Anyway, the Russians seem a powerful threat because of Eastern Orthodox Christianity. Israel is not a threat because it's expected to play into the Book of Revelation and help make End Times happen. The Middle East is a tinderbox people want to ignite in hopes of ending the world. You might think such people don't exist, yet the mentally ill have always been legion. The Man Who Saved Geometry.mp4 from Siobhan Roberts on Vimeo. Donald Coxeter is old and frail in this telling, yet made it to Hungary at age ninety-five, for a 21st century geometry conference. Professor Coxeter is the man to whom RBF dedicated his two-volume snapshot of a work in progress, sometimes referred to as "syngeom", however given a formal title of Synergetics for the Macmillan publishings. Its subtitle: Explorations in the Geometry of Thinking. The writer for this film is Siobhan Roberts, who wrote the book with the same subtitle (The Man Who Saved Geometry), as well as a bio of John Horton Conway, who features prominently, as another Coxeter fan with deep insight into what these polytopes and hyper-dimensional sphere packings were all about. Having someone who has done so much homework write the script makes for confidant, as well as intimate, storytelling. We come to see Donald as bravely defiant in the face of intellectual currents intent upon driving his kind (the Euclideans) from the face of the earth, though perhaps they were joking (Bourbaki was a practical joke). Serious or not, geometry needs its champions in any age if the inter-generational torch is to be passed. Mandelbrot, among others, drew great solace from Coxeter, as his own work was likewise veering into the visualizable, too accessible to Everyman for an elitist core to bless as orthodox. Not that higher dimensional polytopes are all that visualizable or renderable in the vernacular, though with projections into 3-space they are at least tourable (as gems with many rooms). The Euclideans gave us something to strive for that's right brainy, as in exciting to graphical imagination. At least Coxeter Diagrams won acceptance, as they verged on being purely lexical. When the story gets to Fuller, the Montreal Dome of the 1967 World Expo gets the most focus, as well it should, as Dr. Coxeter was Canadian and his first encounter with geodesic domes was at this Expo, at least on a grand scale. A treasure trove of archival scenarios unfurls. My thanks to David Koski for underlining the relevance of this film. Because I'd read the book and watched a Siobhan's address to the Gathering for Gardner crowd, I somehow assumed I'd seen this, but I had not, until tonight. I think The Ramblers could have been another term for The Wanderers, and maybe is, in some parallel universe (in science fiction). Dr. Nick Consoletti was a Saunterer, so The Saunterers might have made do. Whether we wander, ramble, or saunter, we end up learning more about our world, which is sort of the point I suppose. Speaking of points, I've been envisioning myself as a vector in a phase space, the vector sum from previous frames. Elastic Interval Geometry taught me a lot about weighted sums, how the most tensed vector would be like the most important neuron in some hidden layer. Back propagation is accomplished simply by yielding to forces in EIG. Compromises get made. Learning happens. Reshaping occurs. EIG was pioneered in the wake of Tensegrity, computer modeling a lot of the same concepts. Gerald de Jong was consciously inspired by one of Kenneth Snelson's sculptures. He joined us in Seattle at Russ' and Deb's place, along with Karl, Braley (not Brawley) and several others (me too), and much work got done. I was a big EIG aficionado in those days. Those creepy-crawlies of Darwin at Home got under my skin. I purchased an O'Reilly book about Bitcoin at Hawthorne Powell's yesterday, and stayed up late reading it, after finishing teaching. My students were learning all about TLS last night, Transport Layer Security, which involves browser and server employing the latest and greatest cryptographic techniques to make transactions secure. We call it HTTPS and see the little padlock or other icon appear, next the the URL in the address bar. I promised to apply all this knowledge to crypto-currencies when next we meet. I've been a fairly accomplished explainer of RSA for awhile now, getting turned on the cryptography anew by Neal Stephenson's Cryptonomicon awhile back. The whole story of how the NSA initially resisted declassification of this technique is fascinating in the rear view mirror. The Web hadn't become established yet, so the future needs of eCommerce were not featuring in the vector sum. People were worried about "activists" i.e. Daniel Ellsberg types, more than they were thinking about the likes of WalMart and Amazon. These days, Elliptic Curve Diffie-Hellman (ECDH) has made deep inroads when it comes to initializing the session. That's where Bob and Alice establish a common secretly shared key they might then use for AES, or Advanced Encryption System, the winner of an international contest in the wake of the demise of DES. Bitcoin, and the blockchain in general, use a lot of the same ideas. People sometimes think encryption is all about evading scrutiny and carrying on with major transactions completely behind the scenes and off radar. To some extent that's a misconception, as the transactions may be reported in the news, entered into ledgers, kept for future analysts. A company without a coherent internal story is not in a strong position. The encryption step is more about preventing hacks, subtle tricks, which could alter the course of history by corrupting the transaction. Hacks lead to higher entropy, as what should have made sense now no longer does. Put another way, it's fine for the public to find out about all these transactions later on. What's important is that at the time of their occurrence, there's no way to interfere with their content, such as by changing some charged amount or remittance, or substituting a new recipient. The act itself needs shielding, not from the prying eyes of historians necessarily, but from the shenanigans of entropy creators. Cryptography is about authentication, verifying the transaction is not counterfeit. Bob might be completely sincere, but what does that matter if Alice gets the wrong message, one Bob didn't send? Some forms of breakage aren't that easy to mend, as investors (stakeholders) of all types have come to discover for themselves. For me, these blogs are more like Quaker journals, which pre-internet were kept somewhat like diaries, and not necessarily published, or were shared only posthumously. Blogging is different, but nevertheless doesn't have to be about events now occurring in real time. Whether the stock market is up or down needn't be our theme.